When I was young and my parents would take me to the library, I would immediately head for the cookbook section and check out an armful of books–as many as I could carry. At home, I would go through them and bookmark all the recipes that I liked, which I would then type up on 4-x-6-inch recipe cards. By the time I went to pastry school, at age seventeen, I had typed hundreds of recipes. Then, at the culinary school where I received my pastry arts diploma, L’Academie de Cuisine, students had to write their own recipe manuals, using the notes that they had taken in class. Thanks to my experience with copying innumerable recipes, I found the assignment very enjoyable, and my instructor complimented me on my recipe writing ability. That remark first planted the seed for my dream of becoming a cookbook author. I wondered why I had not thought of it before: after all, it would allow me to combine all of my loves–cooking, writing, photography, and travel–into one career. Two culinary diplomas, a certificate in journalism, and a published novel later, I made the dream a reality, when my debut cookbook, Potato Pie and Cherry Pickle: Vintage Recipes from Pennsylvania’s Historic Bucks County, was released on June 28, 2014. I started writing the book in December 2013. I had moved down to Bucks County after graduating from my second culinary school (Chef Training, George Brown College, Toronto), and I was curious to learn more about the culinary heritage of this richly historic region. I bought up all the antique church and community recipe books that I could get my hands on, and began to read and cook from them. I found that many of the recipes were delicious and unusual, but the instructions (or lack thereof) left a lot to guesswork. So I decided to test, update, and re-write the best of the recipes into a new cookbook for the modern home cook. The book contains ninety recipes and is divided into ten chapters. Every recipe is illustrated by a full-color photograph, all of which I styled and shot myself. Each chapter also features a “Bucks County spotlight” on a local point of culinary interest. Here is a sampling of some of the quaint and delectable heritage recipes featured in the book: Lamb Terrapin, Amish Pretzels, Breaded Carrots, Sautéed Cabbage with Sour Cream Dressing, Lemon-Apple Pie, Cocoa-Molasses Fudge, Tokey (a candy-like pudding sometimes referred to as “Food for the Gods”), Blackberry Cordial, and the title recipes, of course! 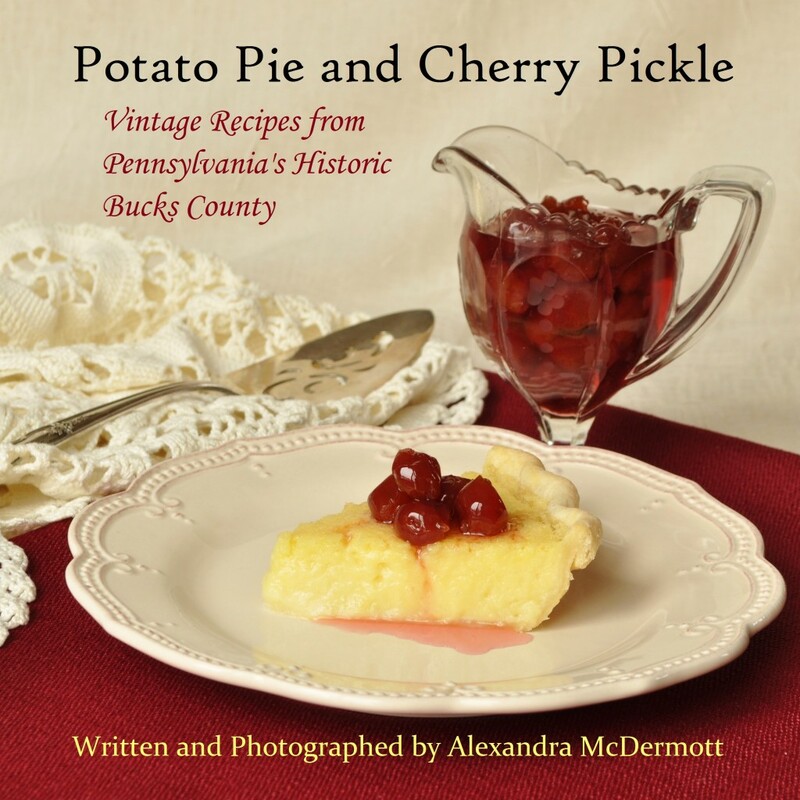 Potato Pie and Cherry Pickle: Vintage Recipes from Pennsylvania’s Historic Bucks County is now available for purchase through my website, as well as on Amazon.com and Amazon.co.uk. If you have any questions about the book, or are a bookseller interested in stocking the title, you can email me at alexandra.mcd74@hotmail.com or reach me by phone at (571) 484-3542.